Thanksgiving is just around the corner, the time when we take stock of our lives and acknowledge the amazing gifts we’ve been given. Like most well fed, well cared for, comfy Americans, I have more things to be grateful for than I can list, especially this year, as my husband and I welcomed into our home a magical and mysterious creature, a now 10-month-old daughter who keeps us on our toes. On a more playful note, and with no disrespect intended to the One our thanks is owed, I’ve been reflecting on my many movie-related blessings. It may be silly, but film is an important part of my life, helping me celebrate what is good and process what isn’t, shining some light into a dark world. I’m grateful that for 15 years I was privileged to work at my dream job at a local newspaper. Over the course of my career, I performed many different tasks, some of them tedious, but I never grew tired of writing about movies. Being a film critic is, hands down, the best job ever. I got paid to drive to Los Angeles and see the latest releases before anyone else did. Most Friday afternoons, I’d pop my head through the door of my boss’s office and say, “I’m going to the movies,” before strolling out of the building long before quitting time. Pondering over, analyzing, nit-picking and discussing films is my favorite pastime and I got to do it for a living, in print, which often resulted in lively debate with readers. Though I worked on the fringes of Hollywood, I had the opportunity to indulge my passion for movies with a wide spectrum of assignments. I interviewed fans at midnight screenings, talked to actors and directors by phone, covered film festivals, went to museum exhibit openings, delved into Tinseltown history and maneuvered my way onto film sets in the middle of the desert. I perturbed Steven Spielberg by sneaking onto the Palmdale set of “The Terminal” (at least that’s what his publicists told me). And I passed out right in front of “Man of Steel” star Henry Cavill at a local premiere (but that’s another story). After all these adventures, I’m surprised at how much I don’t miss my newspaper job, but I do miss spending every day immersed in the silly, strangely satisfying world of Hollywood. That’s why I’m thankful I still get to go to the movies fairly frequently, thanks to a pair of wonderful grandmothers who don’t mind babysitting. And I’m blessed to continue writing about what I love on this blog, so if you’re reading this post, thank you. Going to the movies wouldn’t be half as fun without my two moviegoing partners in crime. My husband, Nick, and I spend almost every date night in front of a flickering screen. When I traveled to L.A. for screenings, he was usually at my side, even though those nights could be tiring. He gamely allows me to drag him to “artsy” fare like “Nightcrawler,” sits through the documentaries I put on our Netflix queue, briefs me on the horror movies I don’t have the nerve to watch and makes sure I’m up-to-date on the latest action flicks. Best of all, as we leave the theater, he listens patiently while I chatter away, deconstructing everything we’ve just seen. I don’t know if anyone else would be willing to put up with my pompous, opinionated rants. When I can’t convince Nick to come along with me, I can always count on my fellow film buff, Kristy. She’s the one who goes with me on a Tuesday night to see “Laggies” or “Tracks” or “Boyhood” when no one else will. When I worked at the paper, she often rode shotgun with me to those exhausting L.A. screenings, hashing out the merits or lack thereof of what we’d just seen during the long drive home. Kristy and I are gearing up for Oscar season, our favorite time of year, when we spend much of our time tracking the results of awards shows, handicapping the various categories and checking off the list of films we have yet to see. We also spend way too much time, energy and money organizing the best Oscar party ever, at which someone is always guaranteed to do something crazy, like run down the street wearing a trash bag or dress up like Jennifer Lawrence. This brings me to the next item on my list of blessings — the fact that one of the best seasons of the year is rapidly approaching. With the holidays looming, Hollywood is ready to inundate theaters with long anticipated, must-see movies, including “The Hunger Games: Mockingjay — Part 1 (opening Friday), “The Hobbit: The Battle of the Five Armies,” “Exodus: Gods and Kings” and “Into the Woods.” It’s like Christmas. Wait, it is Christmas. Even when January rolls around and the studios clean out their closets, resulting in one lackluster weekend at the box office after another, I’ll still have much to be grateful for, thanks to my go-to movies, the films that are a constant presence in my life, always there to comfort or enlighten or provide a bit of escape. For these and so many other cinematic gifts, I will always give thanks. 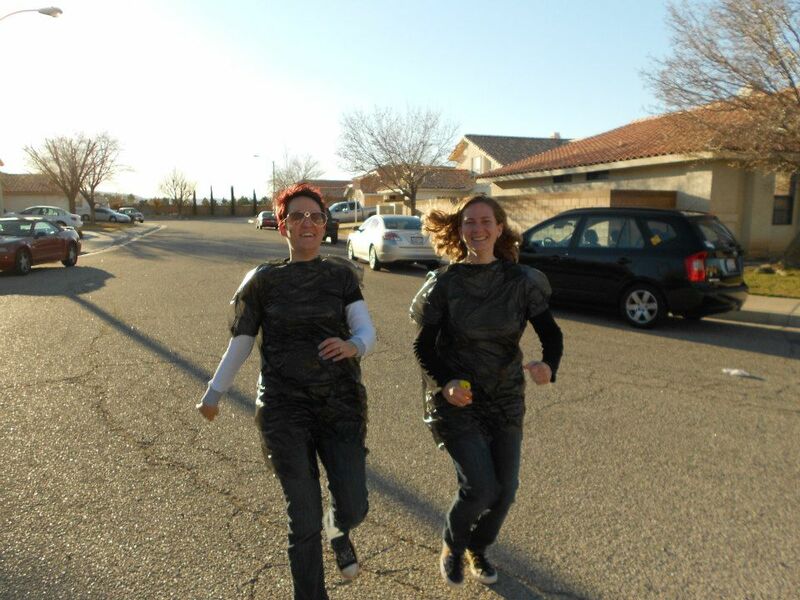 Lavender Vroman and fellow film buff Kristy Rivas take a jog around the block in honor of “Silver Linings Playbook” at a 2013 Oscar party. Image at top: Lavender Vroman on one of her moviegoing adventures. Photo by Fawn Kemble. This entry was posted in Uncategorized and tagged awards season, Christmas, film critic, Henry Cavill, Hollywood, Into the Woods, Jennifer Lawrence, Man of Steel, Oscars, Steven Spielberg, Thanksgiving, The Hobbit, The Hunger Games, The Lord of the Rings on November 19, 2014 by Lavender Vroman.